This 1928 picture of the Carroll Park Comfort Station shows a central open area and entry to the park that wonderfully frames the park. All plans and drawings related to park improvements post-1933 are housed in the NYC Parks and Recreational Department’s Map File Division, located at their design and construction building known as the Olmsted Center in Flushing Meadows, Corona Park. All park plans prior to 1934 are housed at the Municipal Archives. According to records at the Parks Department Map File Division, there is a drawing dated 1935 for “alterations to the Comfort Station” that illustrates new walls and foundations in the center section between the restrooms. The floor plan labels it as a “Playroom.” The park received an overall redesign and renovation in 1935-36. 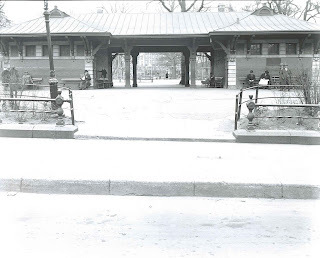 Does anyone know when the Carroll Park Comfort Station was originally constructed, as it may be sometime before I can research.